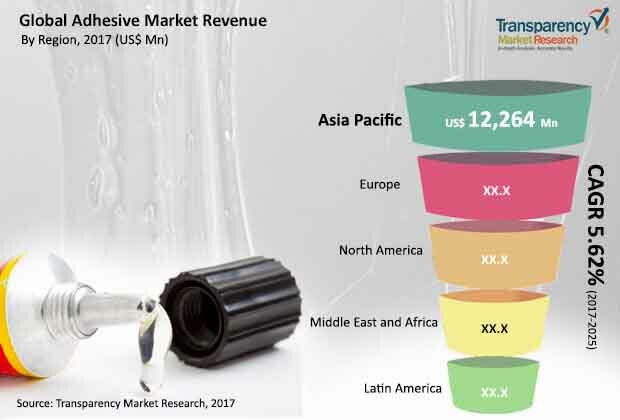 The global market for adhesive is displaying a highly competitive business structure, finds a new research study by Transparency Market Research (TMR). Hipoalergic, Grupo Lamosa, Fitas Flax, Ellsworth Adhesives, Uniseal Inc., Ashland Inc., Bostik SA, BASF SE, Avery Dennison Corp., The Dow Chemicals Co., H. B. Fuller, The 3M Co., Henkel AG & Co. KGaA, and many more are the key stakeholders of the competitive landscape of this market, making it fragmented. The prominent companies are focusing on innovations and technological advancements to strengthen their position. Over the coming years, these players are anticipated to shift their focus towards business expansion in various regions, states the research report. The research study states that the global adhesive market was worth US$34.3 bn in 2016. Expanding at a CAGR of 5.62% during the period from 2017 to 2025, the market is projected to reach US$55.8 bn by the end of the forecast period. Polyurethane, poly vinyl acetate (PVA), acrylic, epoxy, polyester, EVA, and rubber are the main product available in this market. Among these, the demand for acrylic adhesives is relatively higher and this trend is anticipated to remain so over the next few years, notes the market study. The research report further presents a regional assessment of the global market for adhesive, according to which, Asia Pacific, North America, Europe, Latin America, and the Middle East and Africa are the main geographical segments of this market. Among these, Asia Pacific led the global market in 2016 with a market share of 30%. Researchers expect this scenario to remain same over the next couple of years. The main factor behind the dominance of the Asia Pacific market for adhesive is the presence of ample untapped opportunities in emerging economies of this region. Other regional markets are also projected to register a significant increase in the years to come, reports the market study. “The global market for adhesives is gaining significantly from the augmenting need for adhesives in a number of industrial verticals,’ says the author of this research study. Apart from this, the worldwide market is also benefiting from the rising deployment of stringent government regulations and policies, in order to minimize air pollution caused by burning of fuels, since adhesives are highly fuel efficient, states the market report.